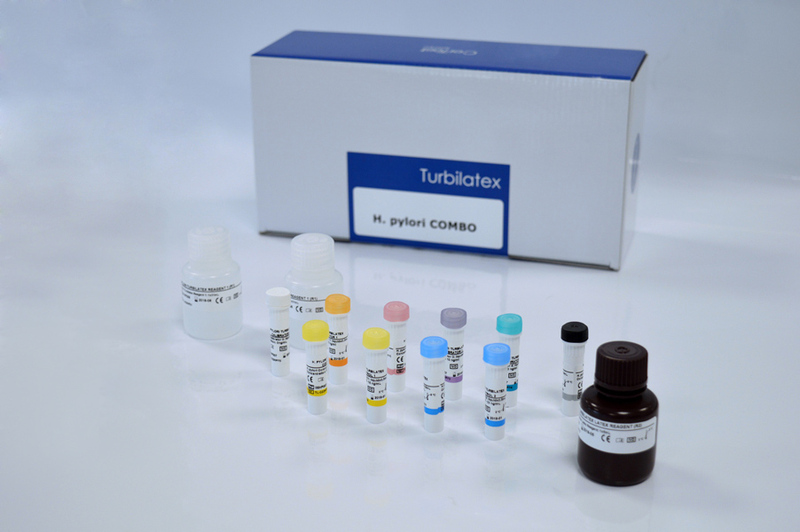 CerTest H. pylori Turbilatex is a latex turbidimetric assay for the quantitative detection of H. pylori in human stool samples. This assay is simple, widely applicable and test results are obtained in a very short time. The intended use for this assay is the detection of specific H. pylori antigen at very low concentrations. The importance of Helicobacter pylori testing has increased due to the strong correlation between the presence of bacteria and confirmed gastrointestinal diseases (stomach and duodenum) like gastritis, peptic ulcer disease and gastric carcinoma. Patients suffering from gastro-duodenal ulcer may develop complications such as upper gastrointestinal bleeding or perforation. H. pylori in the specimen causes a particular antigen-antibody reaction with Anti-H. pylori Monoclonal antibody sensitized latex and produce turbidity proportional to the amount of H. pylori in the specimen.